Eagles Wing Video Slot Machine - Casino Answers! 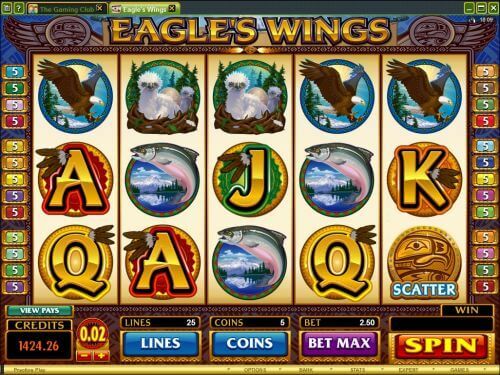 Eagle’s Wings is a 5-reel, 25-line video slot developed by Microgaming, featuring stacked wild symbols, multipliers and a free spins feature. You can play the Eagle’s Wings video slot at Bovada. The Eagle’s Wings casino game is a penny slot machine. Coin values on the Eagle’s Wings slot machine are $0.01, $0.02, $0.05, $0.10, $0.20 and $0.25. You can select 1-25 paylines at 1-5 coins per line. The minimum total bet available is a penny per spin up to the maximum total bet of $31.25 per spin. The Eagle’s Wings slot game has a decent betting range that should suit most online slots players, but if you’re a real high roller who likes to bet it all on one spin, you will be limited with Eagle’s Wings. To play the Eagle’s Wings video slot, select your bet and press the “Spin” button. You can also play all 25 lines at 5 coins per line by spinning the reels via the “Bet Max” button. 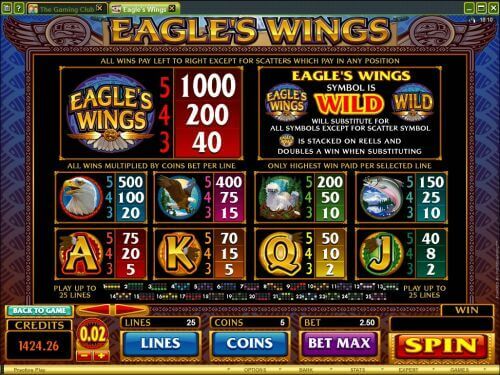 The top-paying symbol is the Eagle’s Wings symbol, which is also the slot game’s wild symbol. By hitting 5 Eagle’s Wings symbols on a selected payline, you will win the 1000 coin top jackpot. The Eagle’s Wings symbol will substitute for all other symbols except for the scatter symbol. This wild symbol is stacked on all reels and will double your win when it appears in a winning combination. The next highest paying symbol is the Bald Eagle symbol (500 coins). Eagle’s Wings’ scatter symbol is the Lucky Eagle Coin symbol. When three or more Scattered Lucky Eagle Coins appear anywhere on the reels, you will trigger the Lucky Eagle free spins feature. Pick the Lucky Eagle Coins to win up to 60 free spins. All wins in the free spins feature are tripled with a 3X multiplier. All bets and lines played in the free spins feature are the same as the game that triggered the feature. Free spins can be re-triggered at the original number of free spins awarded. You can win up to 60 free spins with a 3X multiplier when you play the Eagle’s Wings slot machine at Bovada! Eagle’s Wings has an autoplay feature with advanced settings. To use the autoplay mode on the Eagle’s Wings online slot machine, you must hit the “Expert” button. You can now play 5 or 10 autoplay spins. For advanced settings, hit the “AutoPlay” button and you can now play 5, 10, 25, 50, 100, 250 or 500 autoplay spins and stop autoplay if a win exceeds or equals $100, $500, $1000, $5000 or $9999. Autoplay will stop on any feature contained in the game. You can stop autoplay at any time on the Eagle’s Wings slot game. The Eagle’s Wings video slot is a new video slot, but doesn’t have as many special features as most of the new video slots that are being released. The key to the Eagle’s Wings online slot is that you can win up to 60 free spins with tripled winnings. So if you like the eagle theme and want to try and win a lot of free spins, you can give Eagle’s Wings a try by signing up at Bovada. Can players from the United States play the Eagle’s Wings casino game for real money? No, players from the USA cannot play the Eagle’s Wings online slot for real money. You can play a good selection of USA-friendly slot games at Rialto casinos like Bovada. Do I need to download any casino software to play Eagle’s Wings? Yes, the Eagle’s Wings fruit machine can be found on the first page of the Flash casino at Bovada. You can play the slot for free or real money in your browser. If you have any issues with the Flash slot game, try installing the latest version of Adobe Flash Player.